Published in cooperation with the Radiological and Medical Physics Society of New York (RAMPS). Intended for residents in therapy radiology and radiation oncology to use as a practice exam or for self study. 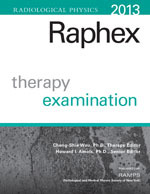 The Raphex 2013 Therapy exam will be more heavily weighted toward newer topics in IMRT, VMAT, IGRT and other new technologies. Traditional topics in previous exams will still be covered, but with less emphasis. The exam matches the format of the AAPM's current curriculum for resident instruction.